Want to throw a baby or bridal shower? Having a Class Reunion? Does your club need a great space in which to hold its next meeting? The Markay is available for rental when not in use for Southern Hills Arts Council programming. The cost is $75 for private parties and $100 for businesses. If you are a charitable organization, the cost is just $50. We offer 20 card tables and 40 folding chairs as well as 2 buffet tables. Of course, this is a non smoking building. We hold 9 visual arts and cultural exhibitions per year, so there is always something interesting on the walls. Naturally, you cannot put anything on the walls. We have easels you may borrow in case you have posters or pictures to display. We do have a tiny kitchen with double sink, refrigerator, and small microwave. At such a modest cost, you will be responsible for setting up and tearing down, as well as cleaning up after yourself. The space is handicapped accessible. If you are interested in renting, we’ll be happy to answer all your questions. 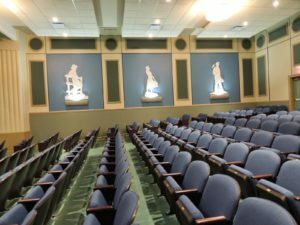 For more information regarding rental of the 280-seat theatre for a business or corporate event, please call the Southern Hills Arts Council directly at 740.286.6355.